The big news for Alcoa Corp (NYSE:AA) investors recently was an upgrade by Goldman Sachs. If Goldman's projects prove true, it would be massive for the aluminum maker and the global aluminum industry... But the "if" here is huge because it relies on China. And to see just how uncertain the future is when China is involved all you need to do is look at Teck Resources Ltd (NYSE:TECK). Here's what Teck can tell you about Alcoa. 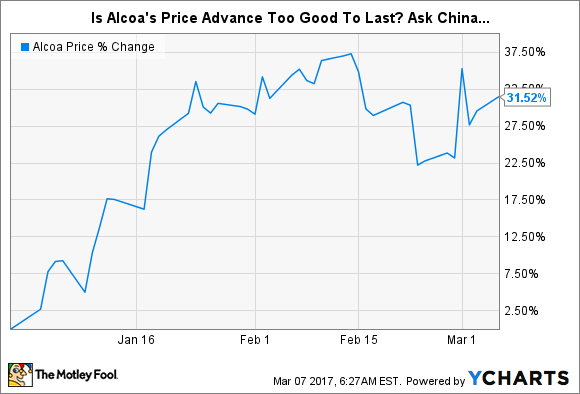 A Goldman analyst essentially explained a situation in which Alcoa's 2017 earnings will increase 66% over Goldman's previous estimate. The 2018 estimate for Alcoa was ramped up by 120%. And the 2019 estimate was raised an incredible 135%! In other words, Goldman is calling for a sea change. Fellow Fool Rich Smith breaks Goldman's call down in more detail, but a part of it is built on improving operations and expansion at Alcoa. That's not unreasonable. As a stand-alone company after the late 2016 separation from specialty parts maker Arconic, the aluminum giant is looking to get its house in order. The problem is that the more important aspect of Goldman's projections appears to be built on China's announcement that it will trim aluminum production by 30% during the winter this year. That, Goldman asserts, will materially increase the price of aluminum because it will leave the world short of the metal. It's impossible not to notice the huge spike between August and November of 2016. And it's equally impossible to ignore the massive plunge that started around December. What drove that? When Teck released third quarter earnings in late October, it highlighted "supply side reform in China" as one of the key factors leading to the met coal price advance. But added shortly thereafter, "We are encouraged by the improved commodity price environment, but remain cautious about how long the supply/demand imbalance will last." Essentially, Teck was saying that cutbacks in China helped boost prices but who knows how long that's going to last. The answer was about a month, since met coal prices started to plummet shortly thereafter. The difference between the two periods was a decision by China to loosen its coal restrictions in... mid-November of 2016. Just about the time that met coal prices started to tumble. So, when Teck announced full-year earnings in mid-February, it had switched gears to say that, "It is unclear how long the price correction will last." This isn't to suggest that Teck didn't benefit from the met coal price run, it did. The company's adjusted profit increased by more than five times year over year in 2016. And it's already locked in high contract prices for the first quarter. But those prices will reset for the second quarter and at much lower levels. So the huge run, at this point, looks like a windfall profit more than a sustainable one. In fact, it seems fitting to end this dose of reality with a quote from Oleg Korzhov, CEO of Russian miner Mechel OAO. During his company's fourth quarter conference call he said, "In our view, the coal market in this accounting period was almost entirely under China's influence." Maybe, just maybe, Goldman is being a little too optimistic.